Ditylenchus dipsaci, the garlic bloat nematode, attacks onions, chives, and leeks as well as garlic. It is also found on other bulb producing plant species, as well as hydrangea, iris, parsley, celery, salsify, some varieties of pea and lettuce, hairy nightshade, and Canada thistle. 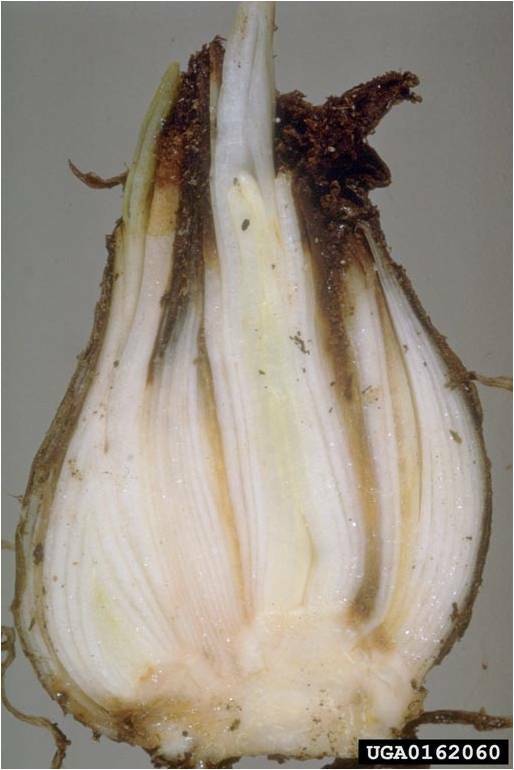 Garlic bloat nematode has long been known in North America but has become particularly serious in the northeastern US in the past several years and has caused significant crop losses. Signs and Symptoms: Stunting, distortion, yellowing, wilting, and premature dieback of leaves may be among the first symptoms observed. Swelling and distortion of bulbs and stems are characteristic. Infected bulbs are light in weight and shrunken, dark brown, and soft. Tissue death predisposes bulbs to colonization by soft rot bacteria and saprophytic fungi. Roots may be partially or completely absent from part of the basal plate. Although they are microscopic, large numbers of nematodes can congregate and form a visible “wool” between the scales of infected bulbs. The life cycle can be completed in as little as 3 weeks if conditions are favorable. Ditylenchus juveniles molt once while still inside the egg. Eggs hatch in the soil, and juveniles molt twice more before migrating toward plant tissue. When the soil is moist they swim to the surface and penetrate plant tissue through stomata or wounds. Roots generally are not affected. They can also swim in films of moisture up plant stems and enter the leaves to feed. It is in this fourth and last juvenile stage that the nematodes are most destructive. Nematodes in this stage can also survive for very many years in dried plant tissue. The final molt occurs inside of the host tissue; they are then adults capable of reproduction. An adult female Ditylenchus can produce as many as 500 eggs. 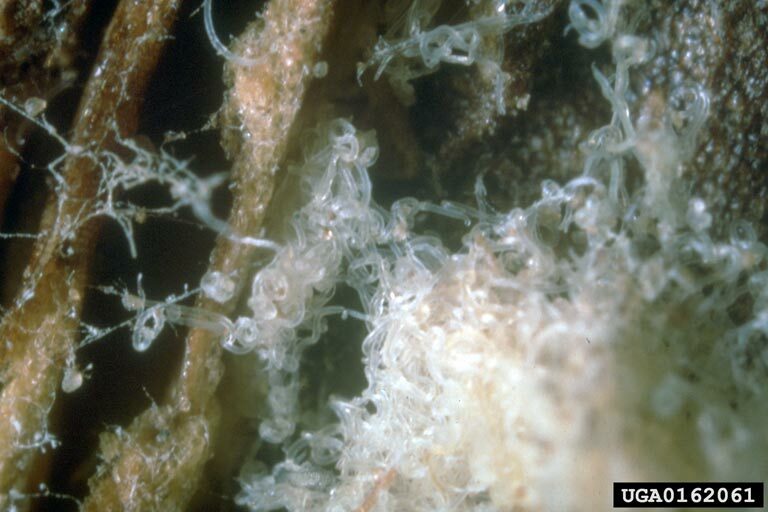 Infected transplants are the most common way in which these nematodes are introduced. Plant nematode-free seed and bulbs. Hot water treatment of seed can reduce nematode numbers but may decrease seed viability and does not eliminate the pest entirely. The most common practice is to dip bulbs in 120°F water for 20 minutes. Temperatures above 122°F will damage tissues. Do not sell seed garlic that is known to be infested. Avoid planting Allium species on sites with a history of garlic bloat nematode. Rotate out of Alliums and other known host crops for at least 4 years. 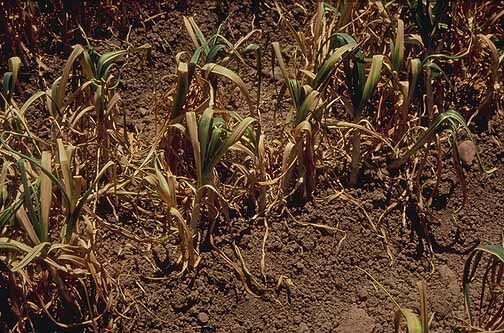 Control weeds as some species may harbor garlic bloat nematodes. Remove volunteer Alliums and as much crop debris as possible, because the nematodes survive better in dried plant tissue than in soil. Nematodes generally do not move far on their own, but can be spread by movement of contaminated soil on shoes, machinery, or equipment. Soil may be fumigated with a registered nematicide after harvest. Some studies have shown that the bio-fumigant activity of incorporated cover crops such as mustard or sorghum-sudangrass may also be effective. Symptoms of garlic bloat nematode can be similar to those caused by other pathogenic organisms. Accurate diagnosis is important for proper management. Information on sending samples to the UMass Extension Plant Diagnostic Lab can be found at https://ag.umass.edu/services/plant-diagnostics-laboratory/vegetable-floriculture-diagnostics.